The brightening of the mid-tones that is done behind the scenes is one of the most common approaches to add punch to a raw image. It often leaves a false impression of properly exposed raw, as we are so accustomed to mixing up exposure and brightness, judging former by the latter. In fact, the shot may be underexposed, sometimes by more than 1 stop, and the price is more noise, more artifacts, less resolution, and, ultimately, getting a new camera, which doesn’t really solve the problem. Even avid Exposing To The Right (ETTR) practitioners can get into this trap, as they consider a histogram derived from the in-camera beautified conversion to be an indication of exposure. It isn’t. 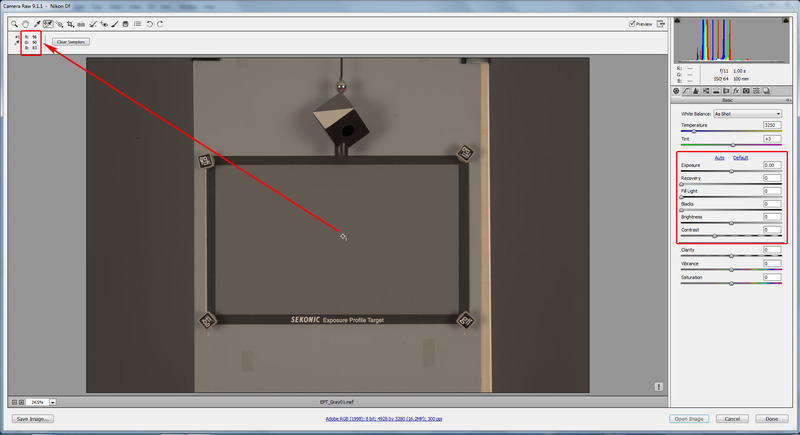 The goal of this article is to demonstrate how you can find the hidden exposure compensation your converter is applying to your raw files when opening them. We will be dealing in depth with Adobe’s converters, but the same method stands for any other converter. There are at least two practical reasons to investigate hidden exposure compensation in raw converters. The first one is to improve exposure practice; the second is to determine which highlights can be brought back safely. That hidden exposure compensation is the exact amount you can pull the exposure slider to get the highlights back, before the software resorts to interpolation to guess what was in the blown-out highlights. In the previous article, we demonstrated how to linearize (to zero out) the default settings in an Adobe raw converter, or in other words, how to override Adobe’s hidden corrections to contrast, brightness, black level, and tone curve (actually, in film terms, all of the above is characteristic curve). Switch back to Process Version 2012 (PV2012); now all of the settings are changed automatically and they replicate the “look of brightness” of the image you previously had in PV2010. Save the resulting settings and name them (optionally, you can set them as defaults). Now, we are ready to find out the value of that important ingredient in Adobe’s hidden corrections recipe, the Baseline Exposure. 1) How to Find the Value for Baseline Exposure (BLE)? Camera models vary in the trade-off they make between highlight headroom and shadow noise. Some leave a significant amount of highlight headroom during a normal exposure. This allows significant negative exposure compensation to be applied during raw conversion, but also means normal exposures will contain more shadow noise. Other models leave less headroom during normal exposures. 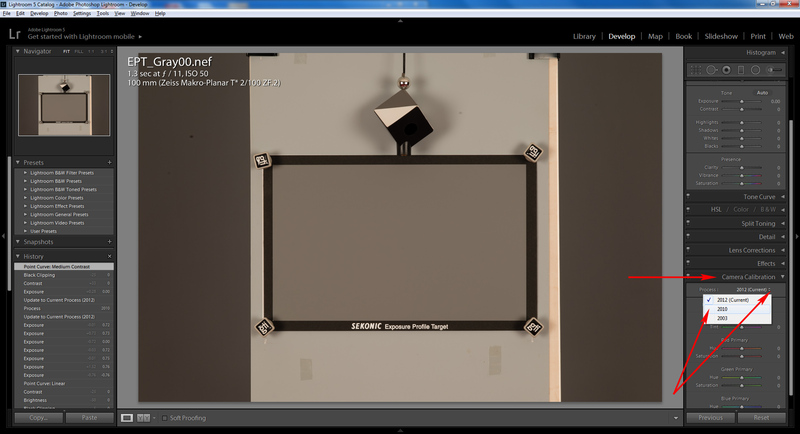 This allows for less negative exposure compensation, but results in lower shadow noise for normal exposures. 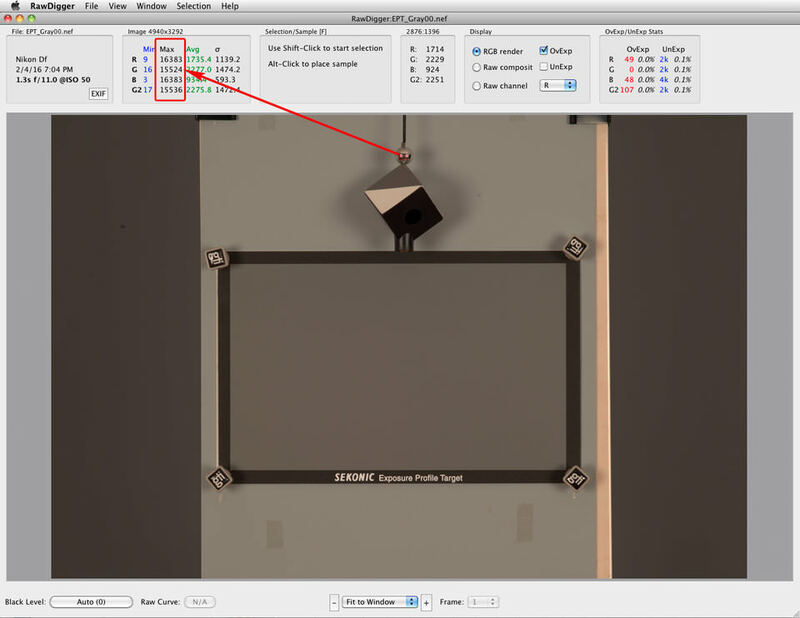 Because of these differences, a raw converter needs to vary the zero point of its exposure compensation control from model to model. BaselineExposure specifies by how much (in EV units) to move the zero point. Positive values result in brighter default results, while negative values result in darker default results. It is important to note that Baseline Exposure (BLE) may depend on the ISO setting, not only on the camera make/model. Generally, there are two ways to determine the amount of this silent (hidden) exposure compensation (which is applied when the exposure compensation slider is set to zero): (I) to read the Baseline Exposure value from the DNG EXIF data, or (II) to derive it directly from the raw files. The first method is simpler, but the second is more fun as you will learn some interesting things about your camera while following it. Since Baseline Exposure (BLE) data is written in the EXIF metadata, but only for .dng files, to use the first method you have to convert the raw shots to DNG. The first is that the EXIF data often contains the average BLE value for a camera ‘make/model’, while the real life numbers for your particular camera of the same make and model may differ, sometimes by as much as 1/3 EV. The second is that sometimes those BLE values in the DNG are incorrect. The third is that if you’re the happy owner of a new camera that is currently not supported by a DNG converter, you can’t really convert to DNG. Finally, what if your converter is not an Adobe one? 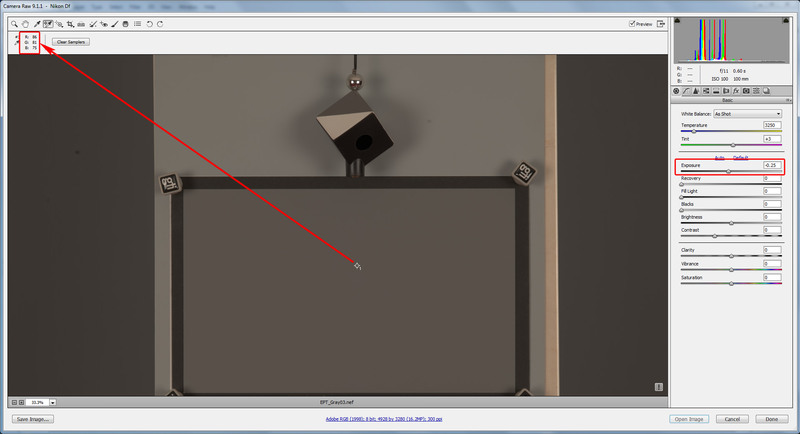 This method will allow you to get the BLE values exactly for your camera, but it will take a little bit longer. For either of those two methods you have to start with shooting. Note: Given that for many cameras the Baseline Exposure depends on the ISO setting, and that thus for different ISO values in the same camera we might have different BLE values, you may want to have shots from EVERY ISO setting you camera allows. If you prefer Method II, skip to the “Determining Baseline Exposure from the Raw Shots” part below. Make a series of shots of whatever subject you like (your lens cap is fine, too), on EACH and EVERY ISO your camera allows, including intermediate ISO values if available (because, as we noted above, Baseline Exposure valued may differ for different ISO values). /Users/username/Pictures/DNG4experiment above is the full address of the folder that contains your dng files you obtained at the previous step. Of course you can use any other name, both for the folder and for the output .csv file. Thus, you will have ISO/BLE data in one spreadsheet. 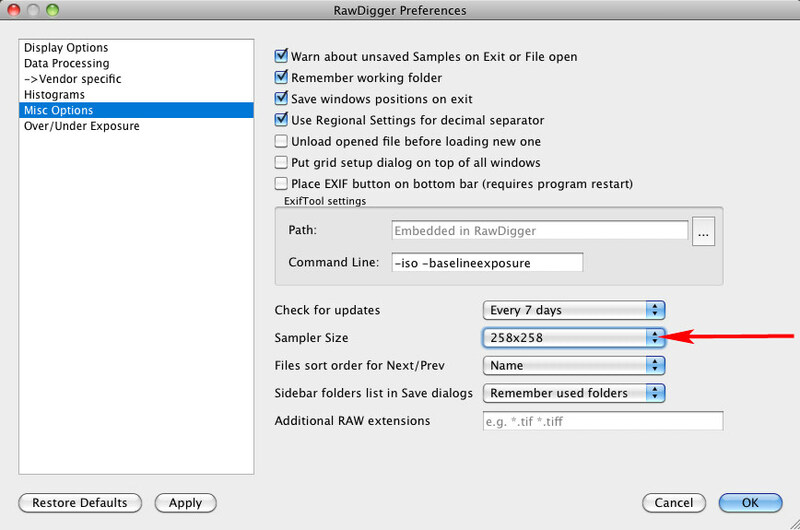 In this case you need RawDigger (you probably can also use some GUI around ExifTool too, instead – look those up on Phil Harvey’s page, under “Related Utilities”), and the lite RawDigger Exposure Edition will suit you perfectly well here. If you are not planning to switch to a new camera in a nearest future, a 30-day free trial should be quite enough for these purposes. For the demonstration below, we will use shots of the same scene with several (not all) different ISO settings on a Sony SLT A55V camera. Paste the text from a clipboard to either an Excel spreadsheet or to a designated text document. Now you have a full list of ISO/Baseline Exposure combinations for your camera. …and zero-out the default settings – set the curve to linear, and black point, contrast, brightness all to zero (by the way, see how the image has changed). We recommend saving those zeroed-out settings as some intermediate preset, which you can load when opening all other .dng files from this series. Far from the factory default “all sliders in zero position”, as you can see. The change is pretty dramatic. Save the resulting setting for the given ISO and name it: now you have a custom zeroed-out default for this ISO setting. Later you can group custom zeroed-out defaults for different ISO setting and rename them according to the values of BLE: say, if for the range ISO 200 to ISO 1600 the Baseline Exposure value (BLE) is the same, one preset named something like “CameraModelName_ISO_200_1600” makes sense. As we have already mentioned above, the following method will allow you to get accurate Baseline Exposure values for your particular camera body, and not some average value for this model. You may also see that Adobe-suggested value for the Baseline Exposure is not always correct for a given camera, or for some of the ISO settings in your camera, like it is with Hi ISO on Nikon Df. Here you also should start by shooting. Using a spot meter make a series of shots – one shot for each ISO setting – of some uniform, evenly-lit surface (a white balance card, a wall, anything) with a piece of curved shiny metal (we used a ball on a Datacolor SpyderCUBE) not far from the center of the shot but outside the spot meter zone. This metal piece will guarantee that you have specular highlights reaching the clipping point, and is thus useful for determining the maximum raw value. 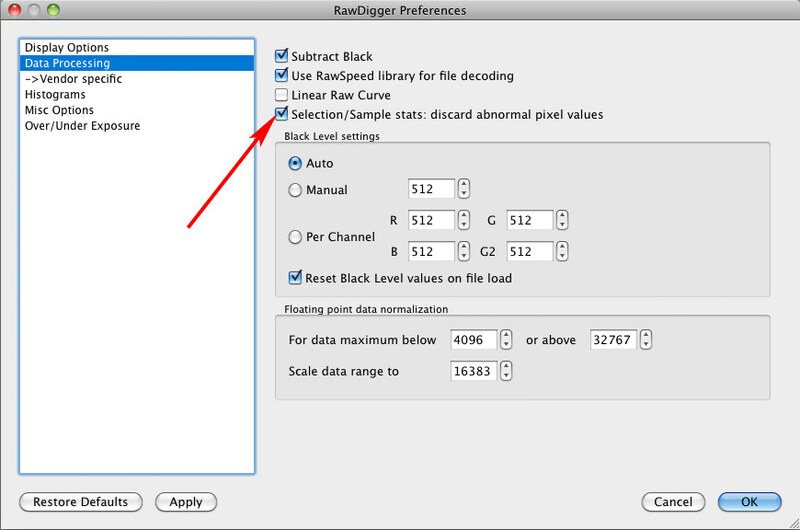 a) In Data Processing tab check the “Selection/sample stat: discard abnormal pixel values” field to filter the outliers off. Read the max value in the Green channel (Gmax) (that’s why you needed to have a piece of dazzling metal in your scene). If your camera has two green channels (most common case in Bayer filter), use the first one. Calculate the normalized value for the sampled Green channel (for the given ISO). To calculate this value we are going to use some formulas (1, 1a-1c). Note: You can just download a ready-to-use spreadsheet with all of formulas and enter the values you obtained for your camera into the first three columns – the other columns will be calculated automatically. After repeating steps 2, 3, and 4 for every raw shot we will have the list of G values – one for every ISO value (the sample stays in place when the next file is opened, so, no need to place the sample each time while on the step 3). In the spreadsheet below we calculated the G values for gamma 1.8 and 2.2 and for 8-bit RGB and percentage Norm values. You don’t need to calculate them all, of course. Depending on what raw converter and what color space you are going to use, pick one combination. We are going to use ACR, setting it to AdobeRGB color space; thus the data (Green channel values, G) comes from the ‘D’ column. The general steps of the algorithm for obtaining the Baseline Exposure values are quite similar for Adobe Lr and other raw converters. 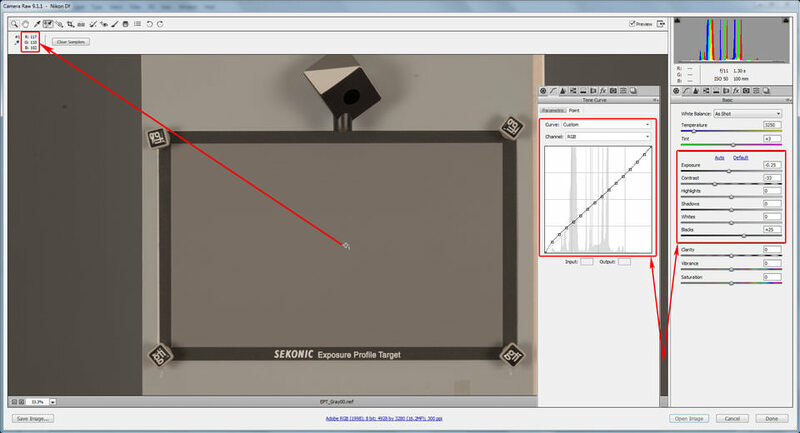 Zero out the settings for PV2010: set the curve to linear, set black point, contrast, brightness all to zero. We recommend saving these zeroed-out settings as some intermediate preset, so for the all other shots you can just upload it. Move the Exposure slider until you have Gsampler ≈ G from the column ‘D’ (once again, you need to use G for the same ISO as in the shot). In our case for ISO 50 G = 106, while Gsampler = 85. So we move Exposure slider to the right (thus, overriding Baseline Exposure) until Gsampler = 106. Note that the Gsampler value changed from 106 in PV2010 to 110 in PV2012. This is because PV2012 is less linear than PV2010. 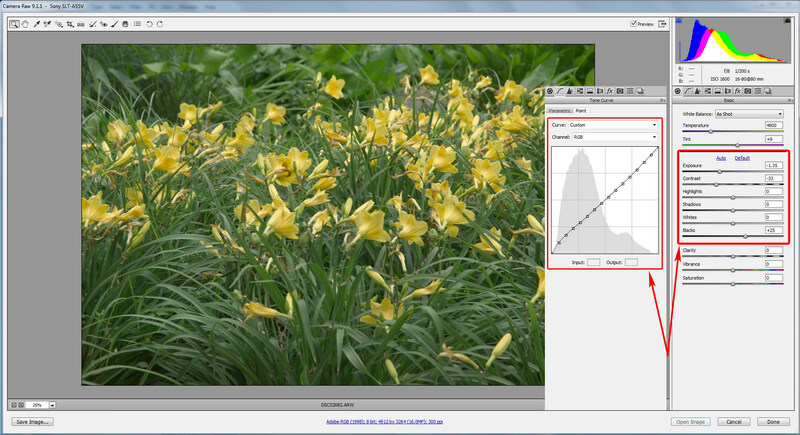 Moving the Exposure slider while in PV2012 to match Gsampler and G as we did it while in PV2010 won’t do much good. It’s already not only Baseline Exposure that we have to override here, but the tone curve also. That’s a matter for another discussion, however. Save the resulting setting for the given ISO and name it (optionally, you can set it as the default). ISO 50, 64, and 80 present an interesting case. 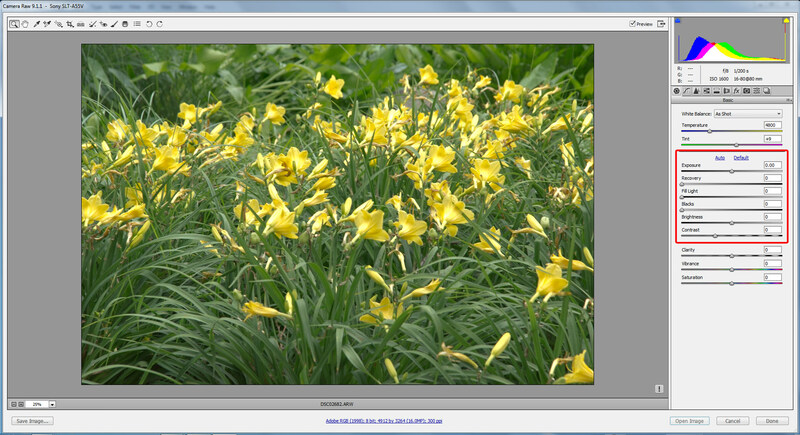 They are what Nikon are calling “Lo settings”; they do not actually rate those in ISO speed. The reason for this is that such “Lo” values are the result of changing the in-camera exposure meter calibration constant instead of the usual change of “gain”. Thus such ISO values result in less headroom in highlights, compared to “true” ISO settings. You can see that the difference between Baseline Exposure for “Lo-1” / ISO 50 (-0.75) and Baseline Exposure for ISO 100 (0.25) is 1 stop exactly; that is, headroom in highlights for “Lo-1” is one stop less than for ISO 100. As per above excerpt from Adobe, they vary the zero point of exposure compensation for the sake of uniformity, using negative Baseline Exposure for those “Lo” settings. This is reflected in the positive values for the exposure compensation we need – because our exposure compensation counteracts / overrides Adobes’ Baseline Exposure, and here the brightness needs to be pushed up after Adobe pulled it down. From ISO 100 up to ISO 12800 BLE = 0.25; Adobe are making the shots at all regular ISO settings to appear brighter than they are. 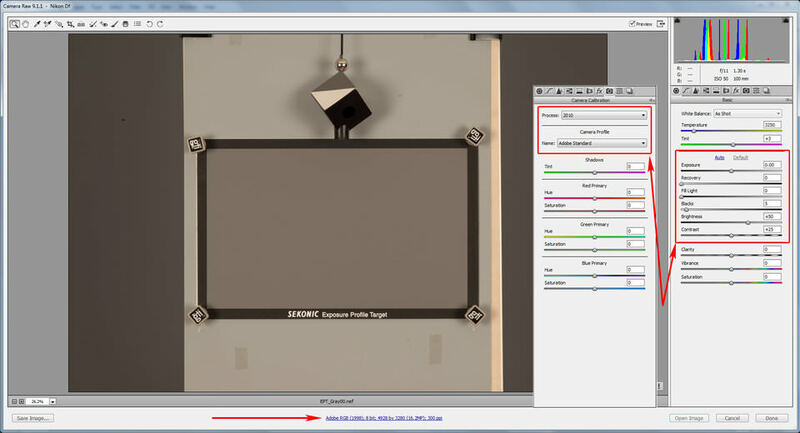 Starting from ISO 16000, however, Adobe BLE data starts to deviate from the real-life data. The problem with obtaining RGB measurements for such low exposure shots is that they contain a lot of noise. Since we don’t have the option of increasing the size of the color sampler in ACR to get good average values for the Green channel, we are going to use all 9 allowed color samplers, and average the readings. 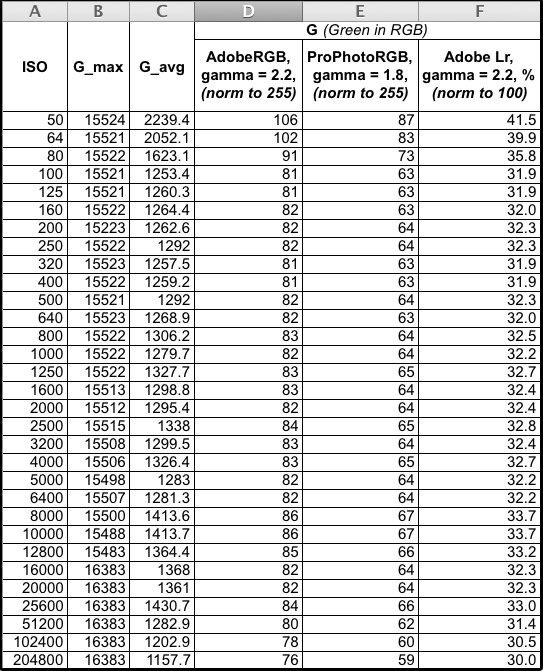 After repeating the procedure for the remaining raw files, we will see that from ISO 16000 to ISO 204800, all of the Baseline Exposure values are equal to 0.37. 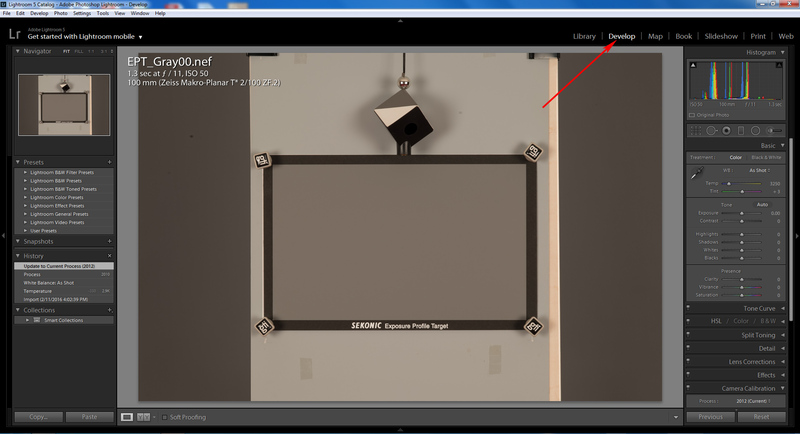 Now, let’s compare the Baseline Exposure values read from the .dng files’ EXIF data with the Baseline Exposure values experimentally obtained directly from the raw files. We convert all of the raw shots to .dng, run EXIFTool using a command line similar to the one described above (Figure 1. ), and tabulate all of the results in one spreadsheet. 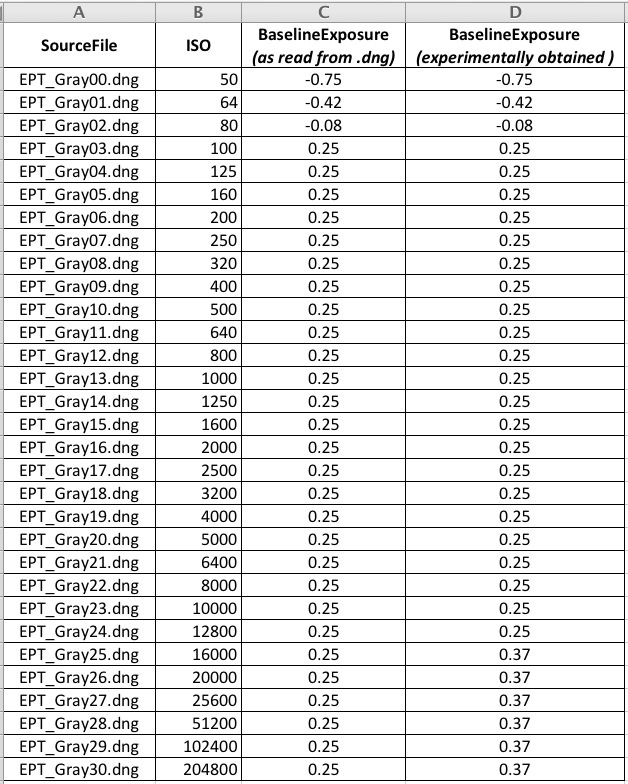 This is exactly what we meant when we said that sometimes the BLE values recorded in a .dng’s EXIF data are wrong. The reason for the discrepancy is that for Nikons’ “Hi” ISO settings Adobe are using the same 15520 White Level (maximum) that they use for regular ISO settings, while in fact for “Hi” ISO it is 16383. So, anything between 15520 and 16383 will, most probably, simply be clipped in Adobes’ converters. Later, you can group custom zeroed-out defaults for different ISO setting and rename them according to Baseline Exposure value. In our case, we will have 5 different presets – for ISOs 50, 64, and 80, as well as ISOs from 100 to 12800, and finally for ISOs starting from 16000. In the next article, we will deal with exposure meter calibration and the headroom in the highlights, based on the shots we just used for determining Baseline Exposure directly from raw shots, and also give an example of how to deal with baseline exposure compensation in a different converter – please post your requests and we will chose the most popular converter for that. For the purposes of Baseline Exposure evaluation, a 30-day trial of RawDigger will be quite enough. Nevertheless, for the readers of Photography Life we’re offering an exclusive 25% discount for FastRawViewer, RawDigger (all editions) and bundles, valid until March 15, 2016. Use the coupon code LIBR-GERP-PHLF at the checkout. Thanks for the thought provoking article. I fully respect your strong credentials, appreciate the knowledge you have shared on Photography Life and DPReview and I own / like Fast Raw Viewer. Perhaps it is the late hour, perhaps it is my lack of knowledge. Whatever the cause, I found this article hard to apply. At the start you talk about how raw converters are applying exposure compensation, brightness or curve adjustments to make an image more pleasing, but less accurate. I’m sure that is true, but not clear why that is a problem. For many this just makes the image better. For those that want to change the image then surely if they use a raw converter they can do so with no image cost? I thought ACR / Lightroom adjustments were non destructive and so could be cancelled out. For ETTR practitioners like Spencer, surely a default baseline exposure can and will be factored into ETTR metering? Again what benefit does this really bring? In the example you gave, are you saying the DF conversion is 0.25 EV biased, but this specific camera is actually 0.37EV biased beyond ISO 12,800? If so, we must surely be splitting hairs in IQ terms on an image that is already a long way from (theoretical) optimal. If one really understands this (I don’t claim to! ), what would they do different, what would the benefit be and how material is that benefit. > At the start you talk about how raw converters are applying exposure compensation, brightness or curve adjustments to make an image more pleasing, but less accurate. I’m sure that is true, but not clear why that is a problem. If the image opens, giving a false impression of being overexposed, it may provoke to decrease the exposure while shooting. That’s the cost, and it is not a good thing. The other part of the cost is that one needs to know by how much the highlights can be pulled back without an extra circle of interpolation in software, which attempts to guess the clipped data. “More pleasing” through default auto adjustments does not work universally (does not work for me at all), and IMHO it is useful to know how to tame the auto. 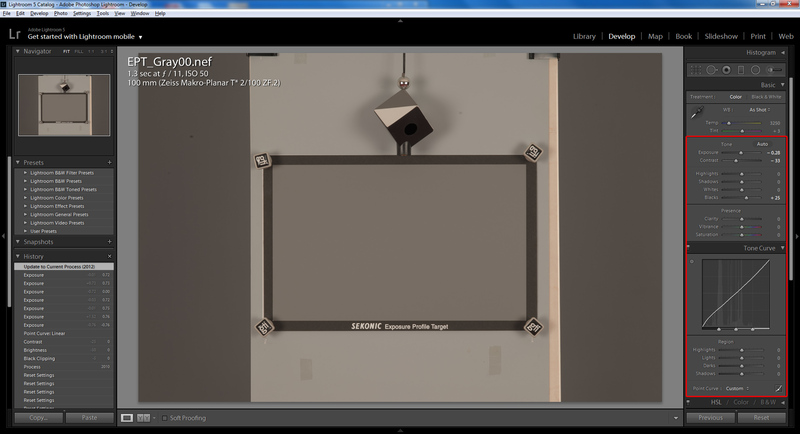 ETTR metering is mostly an illusion, bracketing for ETTR is more realistic. Cameras are metering for JPEG exposure, not for raw, and no amount of effort (less the installation of something like MagicLantern firmware) can fully circumvent this fact. > are you saying the DF conversion is 0.25 EV biased, but this specific camera is actually 0.37EV biased beyond ISO 12,800? No, it is not about a specific camera. It is more like an omission in programming the table for Nikon Df. The point is, one can check Adobes’ data and give them feedback if for his camera this BLE number is off. I do not see how clipping highlights more than necessary should not be taken care of. On Fuji X-Pro2 this error for the highest ISO setting is 1 stop. Thanks for the reply. I understand better as a result! Interesting article, but I have enough problems just getting out to take photos and then processing them in Camera Raw, Lightroom, Photoshop, etc. Sometmies you just have to work with what you got! I am please with the neutral and flat setting, at least it give more freedom and don’t apply too much contrast! Thanks for the articles. I’m still digesting it, but I would love to see this applied to CaptureOne. In particular, C1 has what is called a “Flat” curve you can apply that appears to let you look at the raw file with no hidden curve applied, but I have not done a rigorous analysis of this and would love to hear your take on that. I would be very interested to learn how this all ties in with Sekonic DTS software. 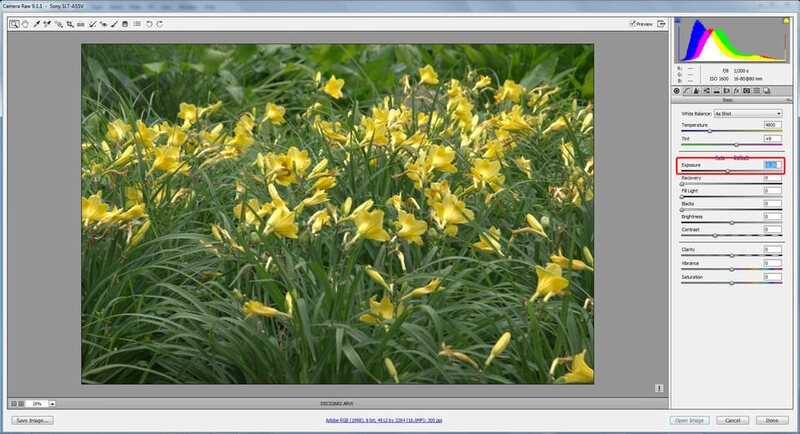 At present the only way I seem to get accurate results is to export a 16 bit Tiff file in ProPhoto Rgb. 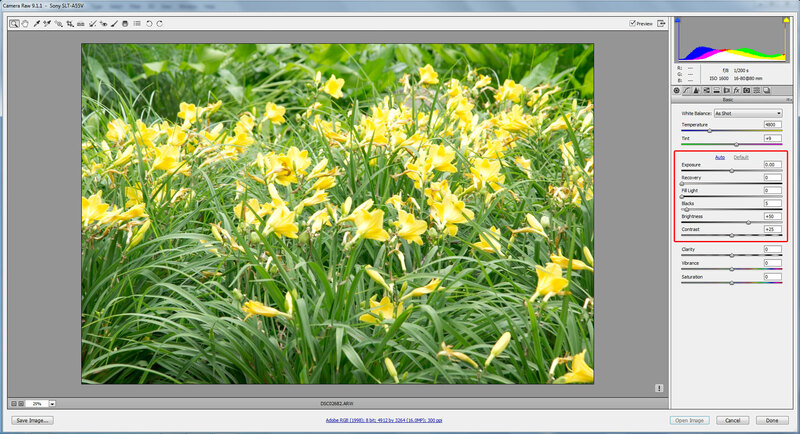 Presumably this is closest to the raw file displayed by Lightroom. Exporting a Srgb Jpeg seems to screw the exposure compensation sent to the light meter. If setting the curve and ble as suggested what output do you consider best for the dts software ? assuming I will have to re do all my Seknik profiles. We will provide the direct way to calculate the compensation (without the use of DTS software) in one of the next articles. If you wish to use DTS software, you can export TIFFs from RawDigger. 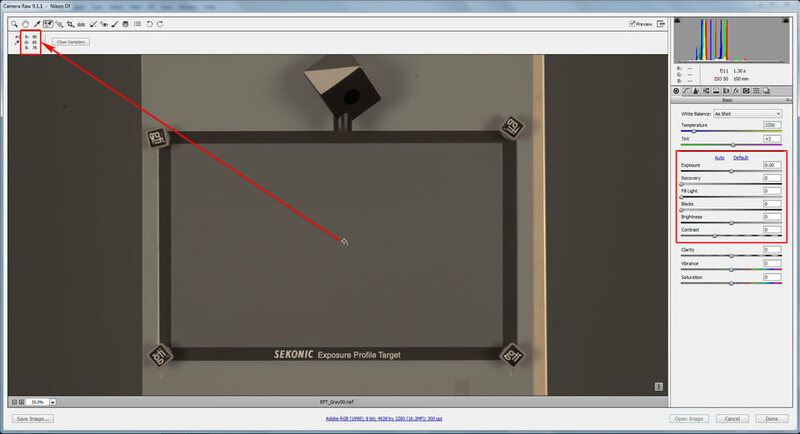 I also use the sekonic 758 and have taken the test images of the test target II. What is not clear in the sekonic DTS manual is what we should set the mid tone values to for ProPhoto RGB. The manual states 118 for the mid tones in sRGB, does this mean I should change the default 118 values to 99 for ProPhoto RGB? Also is it a good idea to make a Sekonic profile using these new default adobe camera RAW settings (zeroed) including the hidden base exposure? What surprised me is the DTS software is now telling me that I only have 1.8 stops of head room above the mid tones in ProPhotoRGB and 2 stops in AdobeRGB. Both colour spaces had approx 10 stops in the shadows before reaching 0 black. However I did wonder if I should now be setting the clipping points to 255 with these new ACR zeroed settings? With careful exposure this should not be a problem and should help maximise ettr. 3 for the ProPhotoRGB settings and DTS mid tones set to 118 I get a meter reading of 10secs at f/9 and 2/10ths which is obviously wrong compared to the other readings above. Also my above point regarding the clipping points is resolved due to the DTS software mid tone settings of 118 for ProPhoto as the profile was pushing the mid tones too high, hence losing highlight head room. My suggestion if people want to use the sekonic 758 to maximise ETTR would be to use the following settings. 4) Set mid tones in sekonic DTS software to 99 for ProPhoto, Maybe Iliah can confirm what the 18% grey rgb number should be? but I know it’s very close to 99. 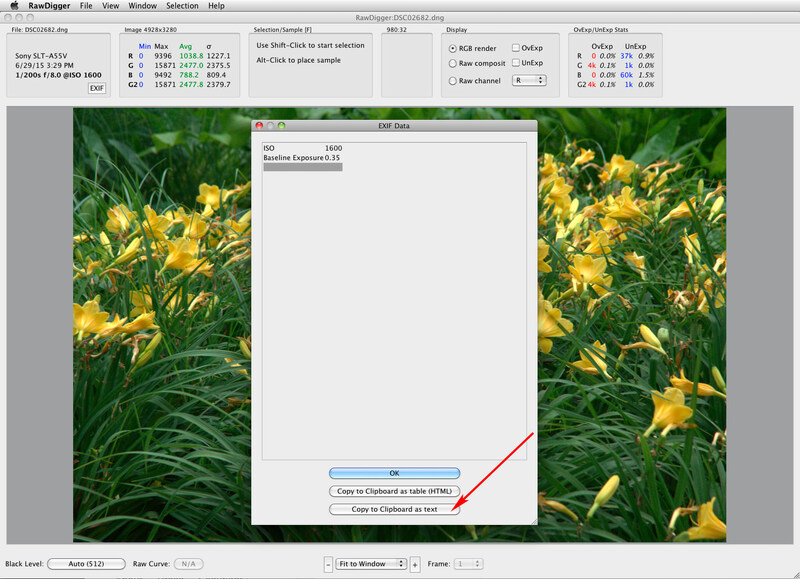 5) If using AdobeRGB or sRGB leave the mid tone setting at 118 in the Sekonic DTS software. If anyone has anything to add or correct me on any of the above feel free as I’m still testing myself but certain those settings will give very good results. Also worth noting that UniWB is very handy to check your camera histogram if in doubt. 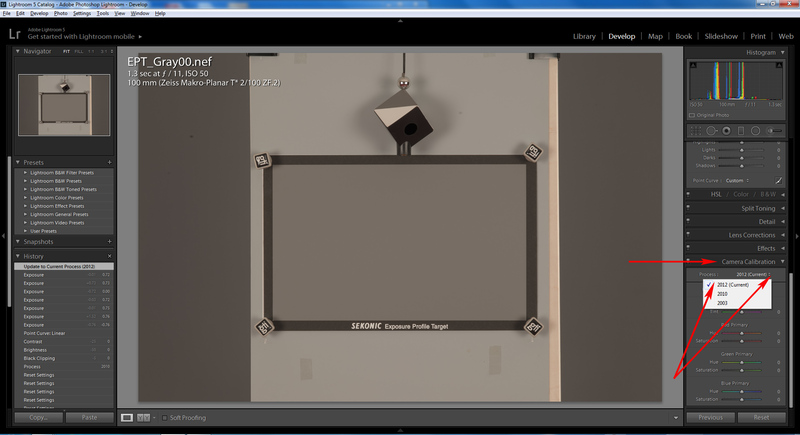 We will make screenshots for Lightroom and post the links. Here are the screenshots, please have a look at the names of screenshot files, too. Wonderful ! 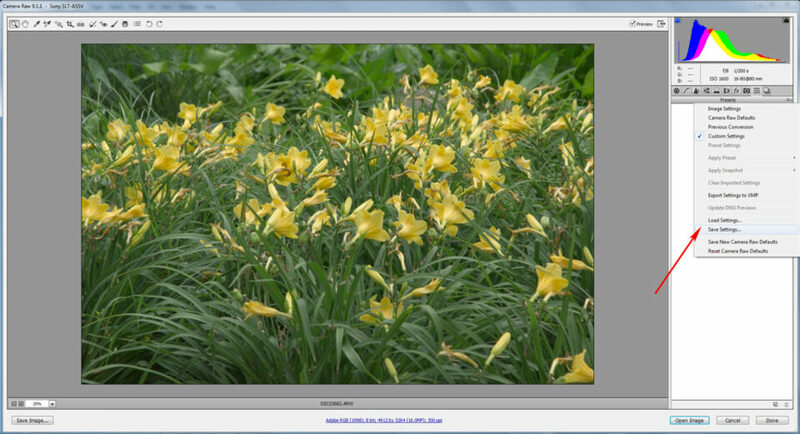 It works perfectly fine and the result with my D610 is very impressive ! Thanks a lot !!!!! 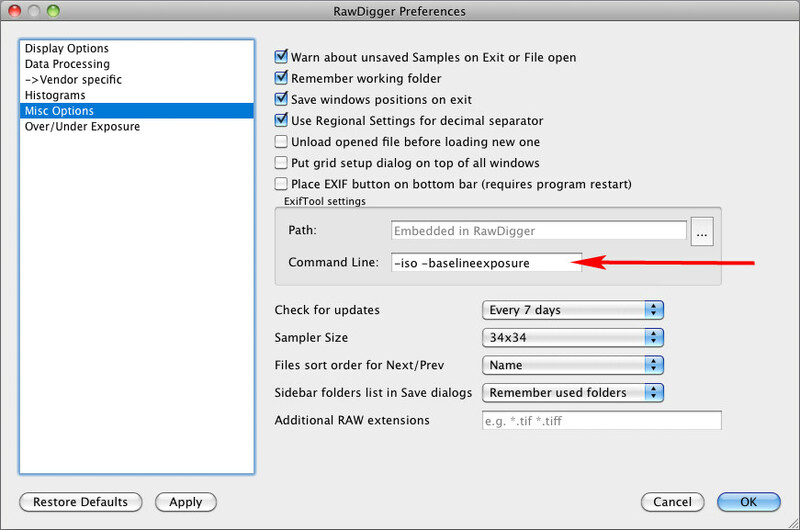 I am not able to get the -baselineexposure command to work in RAWDIGGER. the -ISO works and the default -g works but the -baselineexposure returns no results and when it is the onnly string asked for the little EXIF box dissapears altogether. Nevermind. 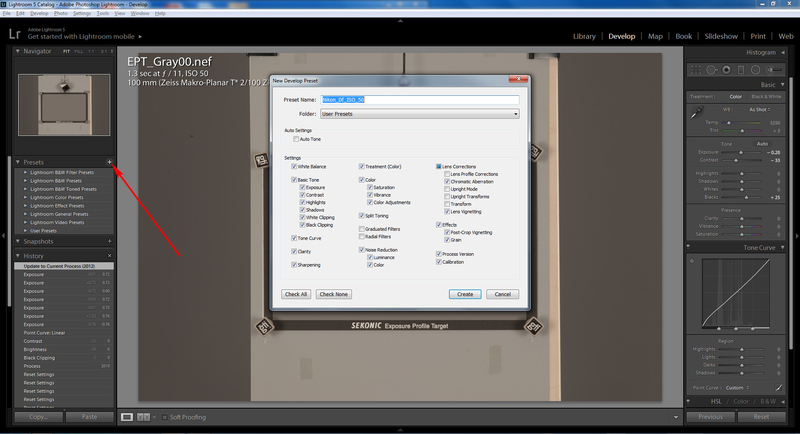 I missed the step where the RAW files have to first be converted into DNG. Do I adjust the exposure, highlights etc sliders and assume that the ‘magic’ of this process is contained in the custom curve that occurs when I switch back from pv2010 to pv2012? I’m presumably missing something pretty obvious!! Well, the editing route here depends on the highlights being clipped or not. If they are not, one can use exposure slider. If they are clipped or close to be clipped, the curve tool is a better option. The point, however, is different. If you’ve processed the image as suggested and it seems dark, with highlights unclipped, the shot is underexposed. Thanks very much, Iliah. Much appreciated. I guess that using the whites and highlights sliders as an alternative to curves wouldn’t cause problems (even if there’s slightly less control)? – for each camera at each ISO, find out how much extra exposure should be given above metered exposure* to avoid genuine highlight clipping at the sensor (which will generally be quite a bit beyond jpg clipping in the camera preview); anything below this is technically underexposure. This will be covered in the next article. Yes, the technique is mostly about not underexposing in the field being misled by converters that bump brightness through adding hidden exposure compensations as well as through adjustments to contrast, brightness, etc. I use curves, as it is easier for me; and store those 12 curve settings that compensate for the dull look. Those curves are doing the same as paper grades, low to hard. I see – I think. Thanks again. If you could do an article on how you reach a finished result after the process you describe in this article, that would help a lot to put things in context!